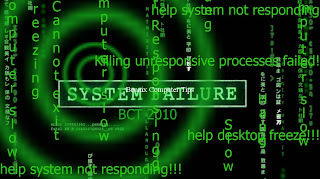 Computer has it's normal time to boot, start and stop a process,Log off, restart, turn off and other activity get done base on the computer clock speed or time of execution.There are a lot of factors why lately you will notice that your PC begin freezing, so slow to terminate a programs or while opening any apps. Freezing or slowness of your computer indicates that there things need to be check and you must do it while you still have an access on your machine for fixing or backup your data before it's too late. 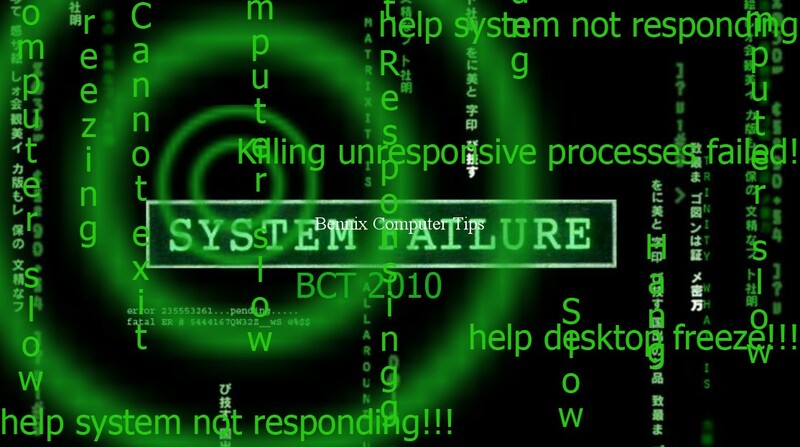 Apparently,there would be a situation that while your computer freeze you can still fire-up a process but unable to terminate it or you can't move the mouse around but the shortcut keys are still working.There are three factors influencing this problem in general;it could be the hardware, software and human error. Just read some points below and might help you someday on your situation. 1. Slow Computer due to Old and Bad Hard Disk - like human being when getting old Hard Disk becomes weak and fragile due to various reasons. Hard Disk failure cannot be notice easily without symptoms and it's dangerous to occur unattended. Maybe someday your computer freeze and you hear a clicking sound in several times then, probably you've got a bad hard disk due to Head Crash. It's better to turn off your computer and do not attempt to boot it again without backups of your data. The more you boot on the Bad Hard Disk the more risk of losing your data. It’s better to consult on experts with data recovery or try hooking up the data at your own risk. There are Hard Disk Diagnostic Tools that may help you to check your Hard Disk health and repair guides to lengthen its life. 2. Freezing due to Resolution Problem - Every computer has its own video card capable for displaying computer graphics. However, computers that have a built-in video card have lesser power to display programs that requires higher resolution to play. If you are incline of playing some heavy computers games that requires much screen resolution then, your PC will freeze. Dota and when I check his computer I found out that it didn't meet the minimum requirement that’s why he encounters that problem. Computers that are using a built in Graphics Card cannot sustain running huge application that has a higher resolution requirment it's better to check properly the minimum system requirement of the software to avoid expecting out of nothing or upgrade your video card to enjoy more valuable programs. 3.Low RAM and HD Memory- Computers that has a Low memory are likely prone to freezing and slow to run programs. RAM is like a human IQ, if sharp it can process more actions at a time. Meaning a little RAM is not productive and reliable always. Big hard disk memory (referring to space) is an advantage because you can store more data in your computer but once it's full, like after you eat probably you're getting difficulties in moving . Compressing data or defragging your Hard disk frequently is a good practice to maintain. You can delete unnecessary files to save space and Keep your files in a proper place is hard task to make your light without freezing. 4. Slaving a External or Internal Drives - This is not frequently happening but computer geek like me had experience slaving internal or external drives will sometimes make your computer freeze or slow. I have observed that your computer speed can be affected by your Slave Drive whether it's SATA or IDE. Frequently, while I have my slave drive my audio performance is affected the sound is waving or distorted in tone. 5. Virus Problem- This is the top cause why your PC becomes slow despite of any hardware or software problems. Primarily virus programs are created just to penetrate, infect and destroy computer systems. However, computer viruses has different characteristics and attacking methods. There are viruses designs to infect the Registry, Boot Sector, System Files, Replicating / Deleting Files, Disable BIOS and so on. But Commonly the goal of the computer virus is to sabotage your system, make it slow, and unusable gradually or suddenly. 6. CPU Temperature -is a rare factor but a noticeable cause also of slow PC. Overheating CPU's becomes weak to process your request and may leads to system failure. Normal CPU temperature is from 30c to 50c while increasing until 100 degrees is very dangerous to happen. If you experience slow desktop movement and frequent blue screen check your CPU temperature using HW Monitor especially if your environment is not well ventilated. 7. Corrupt Registry Files or System Filesdll files like Tune Up 2009, DLL Fixer,etc. 8. Pirated Operating System - Note, Original and Legal software’s are really different in terms of performance against the pirated one. If you are aware, Microsoft validate your Windows copy by using the Windows Genuine Advantage( WGA) tool to determine whether your OS is license or pirated one. Once Microsoft find out that your OS is a pirated copy, a WGA message will display in your screen at the right bottom part of your screen says" You are a victim of software counterfeiting! and while you are booting up a Resolve now or Late dialog will always prompt you. Some pirated operating system contains viruses that if you're not aware when you install it in your machine those stuffs are getting into your files and destroy your system gradually. Tweaked versions are not all safe to use especially if you're a noob user. Original copy stills the best of all for reliability system performance. 9.Program Bugs / Incompatible programs - Unupdated programs could lead to unresponsive performance and usual debugging process which could slow down your system and can makes you annoy. Old programs could not cope up the new system requirement without updates. It's like an Antivirus program the more updated, the more intelligent to detect malicious programs. 5. Securing Your Systems (Installing Antivirus, Virus Scanner/ Blocker, Antimalware / Spyware, Firewalling, Encryption, Ethical Hacking, Adding Security Policy, etc. 6. Cleaning your PC frequently. Almost of the maintenance concerns is related from 1-9 tips. Now, if you miss the maintenance it’s no impossible that your PC will becomes slow. User knowledge is very important because it will solve many problems around by themselves. Just Study and Experience! May some of the reasons are not present in your situation but I promise you will meet them someday.